During my catering days, being able to make a fabulous (and stunning…) dessert in just a couple of minutes (for just a couple of dollars…) was essential to survival. 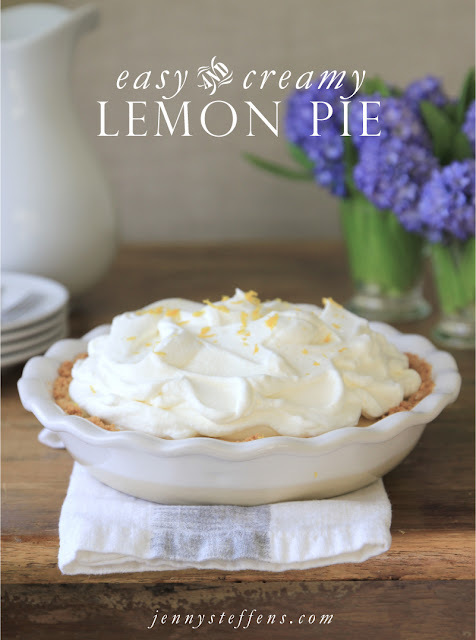 This Easy & Creamy Lemon Pie was often on the menu, especially during the spring and summer months. It is sweet, tart, creamy and refreshing all at the same time. Besides being, delicious – it is unbelievably easy with very few ingredients. I’ve made it in regular pie dishes, or in cupcake pans for mini tarts. I’ve even traded the lemon juice for key lime juice… always a big hit! For the crust, crumble graham crackers into crumbs by processing them in a food processor. If you don’t have a food processor, you can smash them in a plastic bag. Meanwhile, melt the butter in a pie dish in the microwave. Add graham crackers to the butter and add sugar. Mix mixture together with a fork. Press the crumb mixture into the sides and bottom of the pan. A measuring cup can make it easier. Bake the crust for 8 minutes. For filling, mix together sweetened condensed milk, lemon juice and egg yolks until smooth. Pour filling into crust. Bake for 15 minutes. Let cool. When cool, topped with sweetened whipped cream. To make whipped cream, in a mixer fitted with the whisk attachment, add cold cream and sugar then whip until peaks form. Top pie with whipped cream and lemon zest, and refrigerate. 10 graham crackers made 1 cup of crumbs for me!?! Do you use 20 to get to 2 cups?? Help! !